Starting Strength offers a unique approach to coaching barbell weight training and is written by experienced coaches and sports scientists who designed it specifically for training beginners. Learn how to effectively and safely coach the basic core lifts and their programming in an easy to do, step-by-step process. 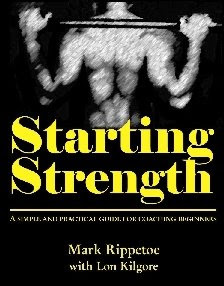 Featuring the most heavily illustrated exercise chapters in print, Starting Strength shows the reader not only how to teach the lifts, but how to recognize and correct the technique errors common to all novice lifters. The book includes sequential animations of each exercise performed correctly, along with practical interpretations of coaching theory, and the anatomical, physiological, and mechanical principles of training. It will help prepare coaches and personal trainers to be more effective strength and conditioning professionals. From the Back Cover Starting Strength is a unique approach to coaching weight training, written by coaches and designed specifically for training beginners. Learn how to effectively and safely coach the basic core lifts and their programming in an easy to do, step-by-step process. Featuring the most heavily illustrated exercise chapters in print, Starting Strength shows the reader not only how to teach the lifts, but how to recognize and correct technique errors.